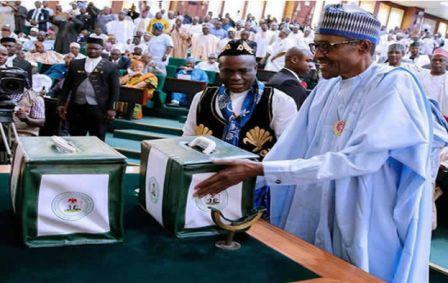 President Buhari presenting the 2018 federal budget to the National Assembly in Abuja yesterday. BudgIT, a civic society organisation says transparent information on looted funds from the federal government will enhance the non-oil revenue plan of the 2018 federal budget. BudgIT welcomes the relatively early presentation of the 2018 Budget and accepts that the economy requires significant fiscal injections to sustain and accelerate economic growth. Significant investment in infrastructure, education, agriculture among others are also important if Nigeria’s hope to diversify government revenue and export base is to be sustained. Improvement in tax administration which the government hopes to push ahead within 2018 as highlighted in Mr. President’s budget presentation speech is also welcome. Equally important is the need to end the cycle of poverty through some form of social intervention. In all, the 2018 proposed budget of N8.6tn and its guiding framework captures a majority of the objectives and philosophy which scholars, researchers and economist are inclined to think about when the need for fiscal injections arises. The philosophy of the current government to spend big due to the relatively slow economic activities is welcome and clearly understood. As such, the capital expenditure allocation of N2.42tn is huge in nominal terms when compared to previous budgets. Given that almost all capital expenditure allocation will be financed primarily by debts, we hope that the line items in the budget will reflect such. Nigeria cannot continue to borrow to buy cars, computers, retrofit office buildings at the detriment of the critical mass needed to end the cycle of poverty and improve the economy. We hope the biggest proportion of capital allocation will go into improving infrastructure, expanding access to education, health among others. Also, we believe the revenue projection of N6.6tn is very optimistic considering the total retained revenue of the federal government including non-oil and oil-related revenue in 2015 and 2016 was N2.8tn and N2.6tn respectively. Federal government non-revenue in the first six months of 2017 stood at N587bn and no significant facts suggesting the figure would double or triple in approaching the new fiscal year. Oil revenue for the 2018 fiscal year is projected at N2.332tn while the biggest bracket of government expected revenue is projected to come from the non-oil sector at N4.16tn. We accept that the budget benchmark is of $45 per barrel is within the band but there has to be excessive caution in keeping the peace of the Niger Delta which is a crucial element in ensuring optimal production. Overall, the budget proposal will need proper interrogation from all stakeholders and analysis will be better when the line items are released to the public in a timely manner in line with the fiscal responsibility act which the president swore to uphold. Also, given that the biggest proportion of government projected revenue will come from the non-oil sector, Government will need to be more transparent about government finances including releasing more information on actual recoveries from loot purported returned by former public officials.